Know how to maintain appropriate speed, position and control when driving the vehicle. Different weather conditions will affect the amount of drip that your car has to the road surface. When driving in the rain, your stopping distance will double of what you normally need at a certain speed. When driving on the snow, your stopping distance will increase up to ten times. So if the weather conditions aren’t ideal, you must take the extra distance between you and the following car. The different weather conditions may cause people to be more cautious while driving in town. In some extreme weather conditions the roads may get closed down, that will force people to use different roads. Also, it is more likely that accidents can happen while severe weather conditions, these can create traffic and tailbacks. Strong side winds can affect lorries, so we will have to take extra care when overtaking and following one of them because the spray from the trucks can obstruct our view. Also, side winds can affect our vehicle’s stability, so when driving in windy conditions, we should keep our hands on the wheel firmly. When driving in difficult weather conditions, road users want to drive away of barriers if it’s possible. Also, people are more aware of everything around them and all the hazards, so in most cases, people are driving slower than usually. If there are a couple of cars following each other at a small distance, this can result in multiple collision. First thing is to take a correct position when getting to a junction. If you are turning left, then keep to the left. If you are turning right, then you have to keep to the centre line. Also, you cannot cut your way through when turning right; you may cause an accident. The last thing is to not stop in the middle of a junction; you must allow enough space for the other road users to pass through. When you are going left, keep to the left. When you are going to the right, you have to keep to the right of the roundabout. 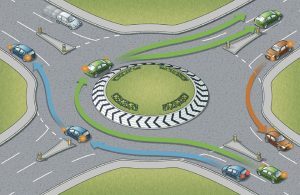 If you are going ahead, you will have to keep to the left of the roundabout and do not try to cut lanes because that may cause a collision. You also don’t want to change lanes at the last second, when you want to exit the roundabout always use the left indicator. When driving on a single carriageway, you will have to keep to the left of the centre line. You should avoid obstructing the view to oncoming traffic. You should keep at least two cars length distance between you and the vehicle in front of you. If you see some people walking by, it is a good idea to make some safe clearance. When driving on a dual carriageway, you want to keep to the left lane at all times. Also if you want to exit the road, you want to keep to the left as well. You are going to use the right-hand lane to overtake and then come back to the left lane when you have finished overtaking. When you see a traffic trying to join a dual carriageway on the slip road, you will move to the right-hand lane to let them join safely. If you cannot move to the right-hand lane, just stay in your lane (you have priority) and the oncoming vehicle will have to wait. 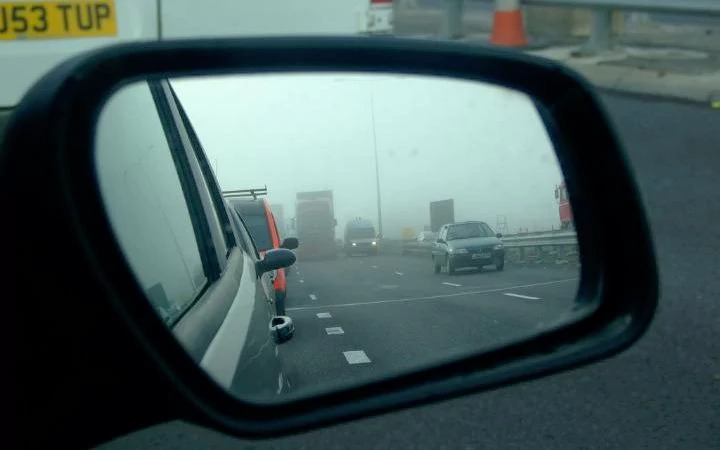 When driving on the motorway, you will have to follow the same rules as on the dual carriageway. You also want to use the right-hand lane to overtake, but also you may take different lanes to head different roads. On the motorways, there are electronic signposts which can be used in an emergency. Over the road, there are sign posts with road directions, and also there is a red cross above a hard shoulder lane which indicated that road users cannot use this lane. Explain the meaning & requirements of the following road signs and information. Circular signposts are giving orders. Post with blue background gives positive instruction (for example you must go ahead). A blue post with a diagonal arrow, tells us to keep to the left of the sign. Signs with the red colour are indicating prohibitions and instructions. For example, you must not stop here. Also, we have speed limit signs ( with red outline) which are indicating that you cannot go above a certain speed. 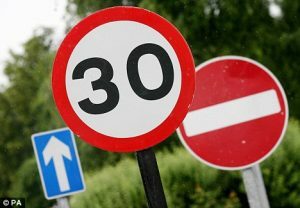 If the outline is green, that means that certain speed limit covers a certain section of the road and time. Triangles are indicating hazards on the road. Triangular signs are used to warn road users of the particular hazard. For example people on the road or sharp bend. Also, we can see triangular posts on the junctions which indicate that you have to give way to other road users. Rectangular signs are giving information about the road. Also, there are signs with the white background which are indicating minor roads. Signs with a green background are showing directions to the major roads, and the brown signs are made for tourist attractions. There are also blue signs for the motorway and any other positive advice. 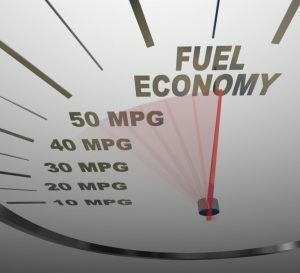 When driving aggressive, using harsh acceleration and braking our vehicle will use much more fuel than driving progressively by smooth ride. By driving aggressively, your car will tear more than if driving smoothly. For example, your engine will have too much load and your tyres, brake pads will wear down quicker. You will have to make inspections more often and replacing parts more often. That will also make your maintenance more expensive. When driving aggressively and taking poor road position, you are more likely to have a collision. Also by not keeping the correct distance between the following car and not maintaining the correct speed, you are more likely to get in the collision. Aggressive driving increases a risk of a collision because you have not got enough time to take action and be aware of consequences. Also, the other road users have not got enough time to react to your actions.